The Harrisburg Bike Share is looking to hire a Central PA Bike Share Coordinator. The Central PA Bike Share Coordinator should be an independent, forward-thinking, goal-oriented collaborator who is looking for an opportunity to expand the bike share program through strategic partnership and sponsorship growth. This is a paid, part-time 10 to 20 hour a week position. Occasional evening and weekends may be required for community events. Communities In Schools of Pennsylvania, Inc., will make reasonable accommodations to enable individuals with disabilities to perform essential functions of the job. The employee will need to utilize basic office equipment such as computers, copiers, printers, fax machines etc. Interested applicants please submit a cover letter and resume via email to jenna@cisofpa.org. Please use “Central PA Bike Share Coordinator Application” in the email subject line. Want to join the Harrisburg Bike Share Team? Become a student ambassador! The Harrisburg Bike Share is seeking a reliable and motivated student ambassador for the Spring semester of 2019. The Harrisburg Bike Share Ambassadorship Program is an opportunity to help build the Harrisburg Bike Share brand and spread the word of its unique philanthropic mission in the community, be an advocate for bike riding, and build your resume while doing it. Core functions include membership drives, event tabling, community outreach, partner and organization communications and executing tasks contributing to the greater marketing plan. Ambassadors report directly to the Harrisburg Bike Share External Relations Coordinator. Hours will vary and be flexible. Bike Share Ambassadors will speak to and help the campus community learn about bike share by hosting event tables, giving bike share demos, and otherwise educating the public. Execute strategies for membership sales. Promote the growth of brand awareness of the Harrisburg Bike Share. Educate the students and faculty of Harrisburg University on the benefits of the program. Assist the Harrisburg Bike Share team with overall expansion efforts, including attending and participating in meetings with prospective partners and sponsors. Work with the Harrisburg Bike Share marketing staff to develop and maintain a marketing calendar of events, and outreach opportunities. Table set-up and manning at campus and community events. Create blog and social media content. Occasional assistance with fleet operations and user experience may also be requested. Currently seeking a degree. Business, Marketing, Communications, and Urban Planning degrees are ideal but not required. Outgoing and highly personable with good customer service and communication skills. Knowledge of social media and a desire to learn business tactics on various platforms. Able to identify priorities and focus on critical tasks. Comfort with explaining the Harrisburg Bike Share’s goals and mission with professionals and community members. Passion for bicycling and related active transportation modes a plus. Applications should be in PDF format and include a brief cover letter with an outline of your ability to meet the requirements, and your current resume. Please email applications to justine@cisofpa.org and include “Bike Share Ambassador” in the subject line. Visit Hershey Harrisburg recently mentioned the Harrisburg Bike Share in an article titled 5 Activities For Outdoor Enthusiasts In The Hershey Harrisburg Region. This morning, Communities In Schools of PA won the CPBJ 2018 Nonprofit Innovation Awards in the Brand Identity/Unique Marketing Campaign category for the implementation of the Harrisburg Bike Share! We are so thrilled and thankful to have won this award, and look forward to what is left in store for our program. Thank you to our sponsors, riders, and our community members who have made our success a reality! On February 6, 2018, the Harrisburg Young Professionals (HYP) met for their annual meeting to reflect on the successes of 2017 and share their hopes and visions for 2018. Each year at HYP's annual meeting, partners and community leaders that have had a positive effect on Harrisburg in the prior year are honored for their contributions. 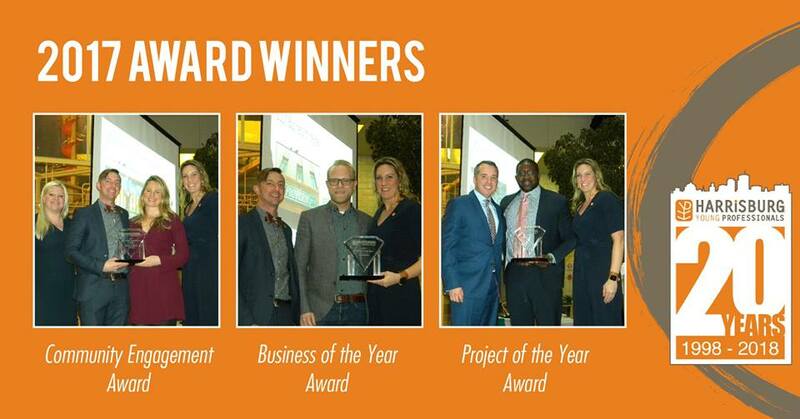 The awards given included Business of the Year, Community Engagement, HYP Member of the Year and Project of the Year. Harrisburg Bike Share was nominated as Project of the Year for their work in expanding eco-friendly transportation options and improving accessibility throughout the city. The bike share was noted for its station at Strawberry Square, a hub of activity in downtown Harrisburg. To read more about Harrisburg Bike Share's recipience of the Project of the Year Award, click here. We have our prizes for the Halloween Costume Contest! Have a costume ready to go? Take a pic with one of our bikes and hashtag #BikeShareHalloween to be entered into one of our prize categories! Dressing up for Halloween? Take a picture in costume with one of our Zagster bikes for the chance to win prizes! From now until the end of October 31, share your pictures and hashtag them with #bikesharehalloween to be automatically entered into the contest. Your pictures will be featured on Harrisburg Bike Share social media! Winners will be announced on November 1, 2017. Originally published in Central Penn Business Journal. October 6, 2017 - How do you get downtown workers to support a bike-share program? Persuade the most vocal advocate for downtown revitalization to buy every one of his employees an annual membership in the program and hope others will follow his lead. That's how Harrisburg's new bike-share program kicked off Thursday. 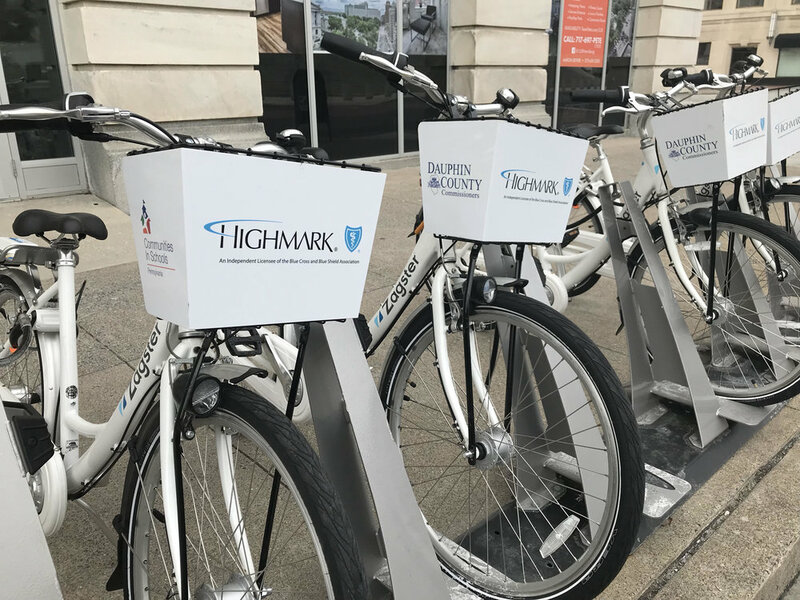 Brad Jones, president and CEO of Harristown Enterprises, one of the sponsors of Harrisburg Bike Share, announced that his company, is purchasing $25 annual bike-share memberships for each of its 150 employees. The company owns Strawberry Square and has been one of the most active in tackling development projects in the downtown in recent years. Jones, an avid cyclist, and representatives from other business and government sponsors, including the Dauphin County commissioners, Harrisburg University of Science and Technology, Harrisburg Young Professionals and title sponsor, Highmark Blue Shield, then took an inaugural ride on Third Street to the state Capitol complex at State Street. Proceeds from Harrisburg Bike Share largely benefit local nonprofit Communities In Schools of Pennsylvania, a dropout prevention organization. Officials said 93 percent of proceeds benefit the nonprofit, which serves nearly 50,000 students and their families. The organization is outsourcing bike-share operations through Massachusetts-based Zagster, a national bike-share provider with more than 200 programs in 35 states. Harrisburg Bike Share has 55 Zagster bikes available at 11 stations throughout the city. Most locations are in downtown Harrisburg. The bikes costs $90,000 per year and the organization has a two-year commitment with Zagster, said Ryan Riley, president and state director of Communities In Schools. Business and government sponsors are helping to offset the costs. Dauphin County, for example, contributed $16,500 to the program. Commissioner Jeff Haste called the bike-share program a great attraction for both residents and visitors to Harrisburg. Plus, it should help take some vehicles off the road during lunch hour, while helping downtown workers navigate to places like the Broad Street Market in Midtown. In addition to the $25 annual memberships, which include free trips under two hours, users can opt for pay-as-you-go memberships, which are $2 per hour, up to $20 per ride. People who keep the bikes for more than 24 hours will be charged an additional $50 in overtime fees. To rent the bikes, users need the Zagster app for smartphones. Through the app, riders find a bike number and enter it to get an unlock code, allowing them access to the bike. There also is a ride-by-text option. Originally published in The Burg. October 5, 2017 - Community members joined city officials this morning for the official launch of the Harrisburg Bike Share, where the mayor also announced a new initiative to encourage motorists to share the road with cyclists. Speaking from the atrium at Strawberry Square, Mayor Eric Papenfuse said that the city will establish its two bike boulevards in the spring on low-speed, low-traffic streets. A boulevard on Aberdeen Street will connect the Capitol complex and the Harrisburg Transportation Center, and another on North Street will extend from the Capitol to Riverfront Park. The city will paint both roads with “sharrows,” road signs indicating a shared lane for cyclists and motorists. The signals do not designate the roads as bike-only lanes. Other than the road signals, the bike boulevards will not receive additional traffic control mechanisms or construction. Though they may be a small step, the boulevards are part growing bike infrastructure in Harrisburg, Papenfuse said. “Soon, we will have an interlocking system of bike lanes and bike boulevards in the city,” he said. He added that the city hopes to create bike lanes on 2nd street when it is repaved and painted for two-way traffic, a project still a few years away. Harrisburg’s Bike Share has been in operation since last Friday. The program comprises 55 communal bicycles docked at 11 stations throughout the city’s Midtown, Uptown and downtown neighborhoods. Ryan Riley, president of Communities in Schools Pennsylvania, the organization spearheading the program, said 145 new members have collectively taken 205 trips with the Bike Share since last Friday. Riley also reported that two docking stations are forthcoming at the Harrisburg Transportation Center. All nine others are already installed and operable. The Bike Share is sponsored by the Dauphin County Commissioners, Strawberry Square and Highmark. All technical support and bike maintenance is managed by Zagster, a startup that operates more than 100 bike shares across the country. Riders must pay to use the bikes, which they can unlock through the Zagster phone app. A $25 annual membership gives riders free access to bikes for periods shorter than two hours and then charges $2 for each hour after that. “Pay as You Go” members will be charged $2 for each hour they use a bike. Users who register in October can get a $10 discount on annual memberships by entering the promo code “rideharrisburg” in the Zagster App.